LYON, France – An INTERPOL-led operation targeting criminal organizations behind the illegal trafficking of ivory in West and Central Africa has resulted in some 66 arrests and the seizure of nearly 4,000 ivory products and 50 elephant tusks, in addition to military grade weapons and cash. As part INTERPOL’s Project Wisdom, and supported by the International Fund for Animal Welfare (IFAW), the four-month (January – May) Operation Wendi coordinated national wildlife enforcement authorities, police, customs and specialized units for targeted inspections and investigations against the illegal trade in ivory and other illicit goods by wholesalers, retailers and individuals. The interventions across five countries – Central African Republic, Côte d’Ivoire, Congo, Guinea and Liberia – also resulted in the seizure of 148 animal parts and 222 live animals, including crocodiles and parrots, which were released back into the wild. “Wendi is one of a series of operations planned to tackle this crime which threatens both biodiversity and civil society, and its success is due to the hard work of the officers on the ground and the strong cooperation between the involved agencies and organizations,” said David Higgins, Manager of the INTERPOL Environmental Crime Programme. “The increased poaching of elephants and trafficking of their ivory requires an equally strong response. Addressing this crime at its source, in transit and its destination is key in dismantling the criminal networks who profit at the cost of wildlife and the environment,” added Mr Higgins. The operation followed a training programme hosted by INTERPOL’s Regional Bureau in Abidjan and sponsored by IFAW, where officers were updated on the latest search and seizure techniques and enabled the exchange of information and expertise. “Elephants are under more threat today than they have been in years. 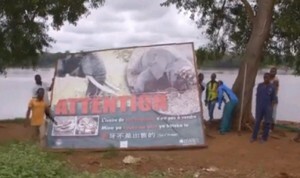 This is why we need a completely coordinated effort by the international law enforcement community starting in source countries if we are to have any chance of success against the crime syndicates who are behind the slaughter of elephants for their ivory,” said Céline Sissler-Bienvenu, Director of IFAW France and Francophone Africa. Project Wisdom supports and enhances the governance and law enforcement capacity for the conservation of elephants and rhinoceroses by encouraging communication, cooperation and collaboration with respect to intelligence exchange, cross-border investigations, and capacity building. The data collected throughout Operation Wendi will be compiled, analysed and used as guidance in future enforcement efforts. The illegal trafficking in ivory and other wildlife products will be a key topic of discussion during the INTERPOL Environmental Compliance and Enforcement Events 2013 in November.